Saturday was a long day. I only got two hours of sleep and I worked an 11 hour day. When I called home as I was leaving Grand Rapids, J said she wasn’t feeling great either and didn’t want to go out. I was fine with that, but I still wanted to pick up dinner. I wasn’t in the mood for pizza and the first thing that jumped in my head was Taco Bell. I almost settled on that until I remembered Qdoba. 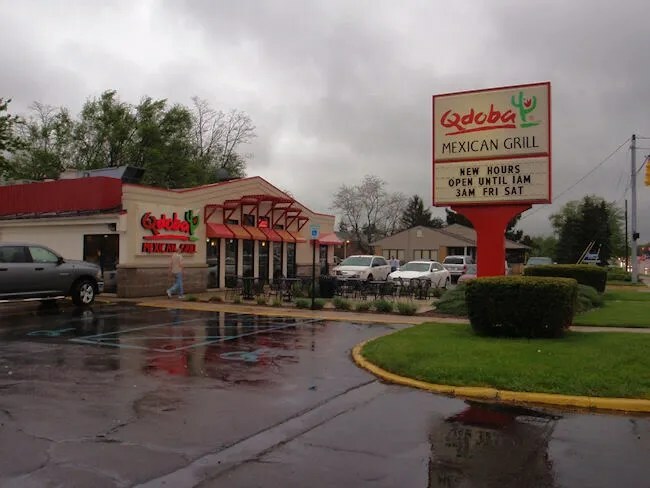 Qdoba Mexican Grill has three locations in the Kalamazoo area. We’ve eaten at the Portage location in the past. The two Kalamazoo locations are on Gull Road and West Main. The Main Street shop was the closest to the highway. After getting of 131, I headed east on Main to find the building on the corner of Main and Picadilly Road. It’s not very often I’ve come across a stand alone Qdoba. Usually they are in strip malls, but this location has a building all to itself and it was a pretty popular dinner option on this particular Saturday night. As I was driving home, I was talking to my brother and trying to explain to him what Qdoba was. It’s not quite like the normal “Mexican” fast food places. They have more options and most of the food is actually made fresh on site. A couple of J’s cousins work at a Qdoba in Illinois and we were surprised to learn just how much was made on site. The ordering is done kind of like a sandwich shop. I was, for the most part, just ordering for myself. All J wanted was chips, salsa, and guacamole which is ordered at the register. They already have the salsa and guac packaged up and the chips are in a warming drawer underneath the register. The clerk just has to grab a paper bag and scoop the warm salt and lime chips into the bag. I went with hot salsa because their medium salsa is a green chile salsa which is alright, but the green color throws me off. 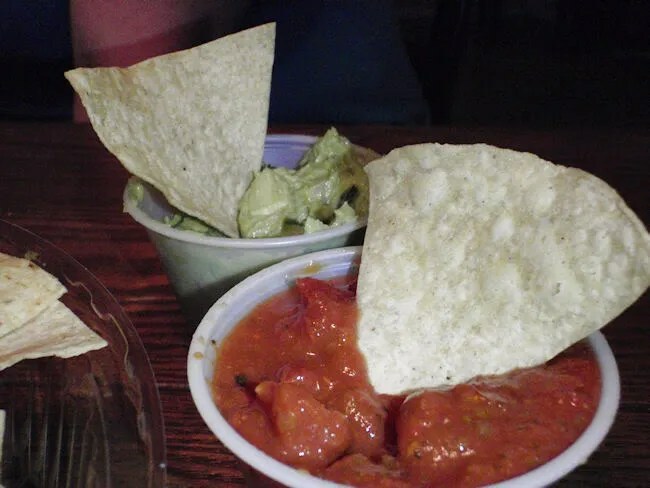 I’d rather have a red salsa….just a preference. I went with three tacos which I got in a hard shell. The one thing Qdoba lacks are corn tortillas. 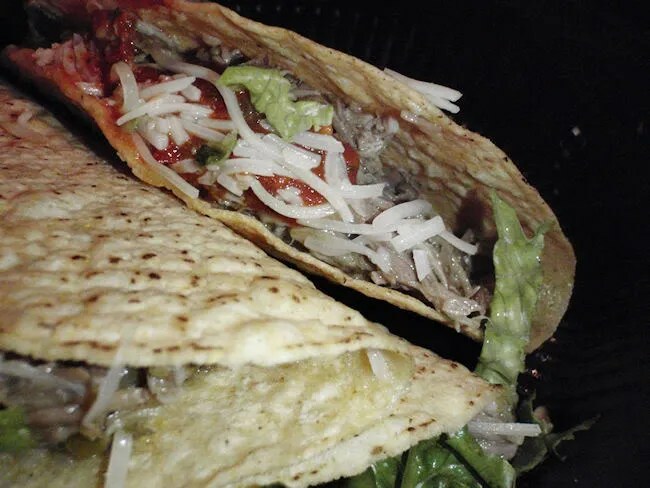 If you go with soft tacos, they use flour tortillas. If they did corn, I would eat there much more often. I got the pulled pork tacos with cheese, lettuce, and more of the hot salsa. The pork is not a smoked pork. It’s roasted but it’s still very tender and very juicy. The cheese is white and a blend of three Mexican cheeses instead of using cheddar like the other places do. 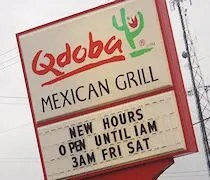 I was turned on to Qdoba several years ago by a co-worker that loved the place. I didn’t really get it at the time, but it’s kind of grown on me. I like the place, but it can be a little expensive. The three tacos and chips cost a little over nine bucks. In the grand scheme of things, that’s not that bad, but if I just want cheap tacos, there are place to get them cheaper. If I want good tacos that aren’t 80% something other than beef, I go to Qdoba.